Built in the local style of village architecture, Arna Jharna evokes the romance of nomadism with open-air music performances by local groups and artistes of the region. It also houses a matchless collection of folk musical instruments unique to western South Asia, including the jantar, jogia sarangi and nagfani, which are no longer used or produced. Rupayan Sansthan is presently raising funds for a research project linking the musical instruments in its collection with musical traditions available as recordings in its audio-video archive. The publication of a catalogue and monograph, as well as the renovation of the musical instruments gallery to incorporate the AV experience of associated musical traditions are also envisaged. This bowed chordophone or stringed instrument is used in some form or the other from Iran and Baluchistan in Pakistan to north and east India. It is used only by the Surnaiya Langas in western Rajasthan, where it is also known as the surinda, as accompaniment to the aerophonic instruments played by these exclusively instrumentalist musicians. It is made of sheesham wood and has eight strings. Note the intricate patterns decorating these particular instruments. 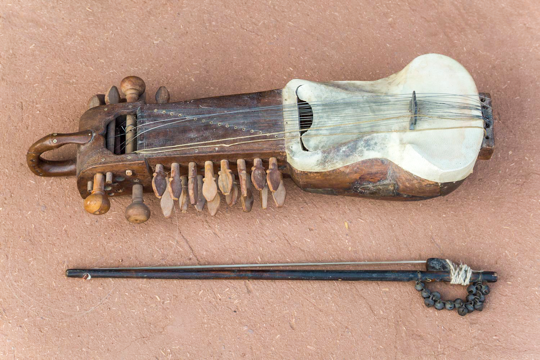 Different kinds of this bowed chordophone—the sindhi sarangi, pyaledar sarangi, gujratan sarangi, dedhpasli sarangi and jogiya sarangi—are used in different parts of Rajasthan by Langa, Manganiar, Dhadhi and Mewati Jogi musicians. The sarangi produces a specially lilting tune. Note the ghungroos or bells on the bow of this particular jogiya sarangi that would have provided rhythmic accompaniment. 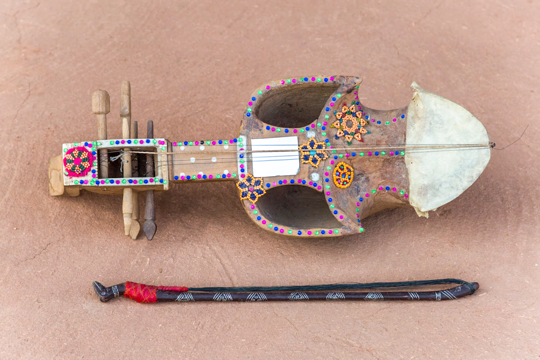 The long neck of this string instrument lends itself to being held up and played by Nayak or Bhil bhopas or priests as they dance in the Pabuji re phad performances. 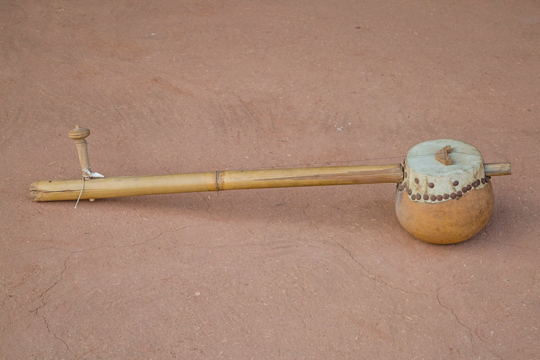 The sound of the ghungroos attached to the bow are an intrinsic part of the instrument’s music. 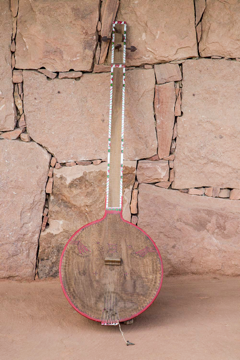 The resonator is made of coconut shell, and one string of horse-tail hair and one or two of steel stretch across the long neck of the ravanhatha. Importantly, the bhopas themselves manufacture this signature instrument of theirs. 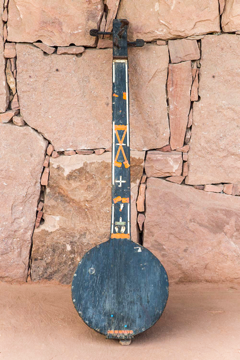 This bowed chordophone is reflective of the shared history of the western frontier of South Asia, as it is only found in Sindh in Pakistan and western Rajasthan, used exclusively by Manganiar musicians. Komal Kothari traces its origins to Gujarat. It is immediately recognisable by its large, rounded body covered with goatskin. It is usually carved out of a single block of mango wood and sometimes sheesham. Its two main gut strings are made of goat intestine and other three strings are made of steel. On the whole, it has 17 strings. It is played with a bow known as gaj. 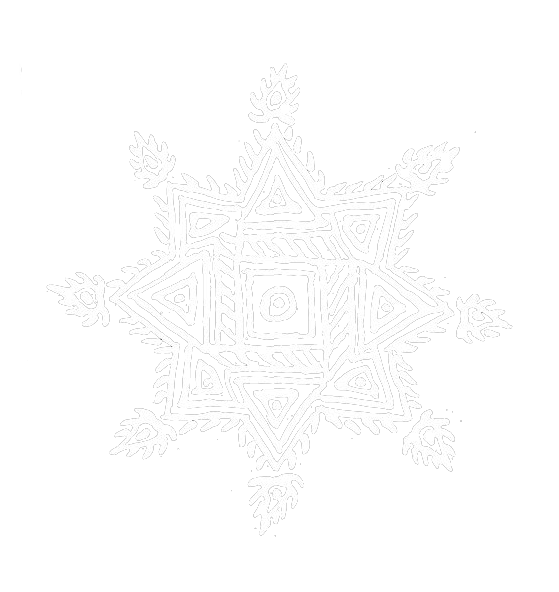 The kamaicha is known for its deep, haunting melody. The ektara is a plucked chordophone, commonly used in devotional music in different parts of India, Pakistan and Bangladesh. The great Bhakti saint of Rajasthan, Meera Bai, used it to sing all her compositions. A single string stretches from a small resonator across a long bamboo neck, which is plucked by a single finger. Also known as the veena or chautra, it is used by the Meghwal, Kamad and Bhil communities in devotional group singing. The tandura can be found all over Rajasthan except in the district of Jalore. The player wears a mijraf or plectrum on the tip of the index finger, striking the strings with rhythmic stress from right to left. 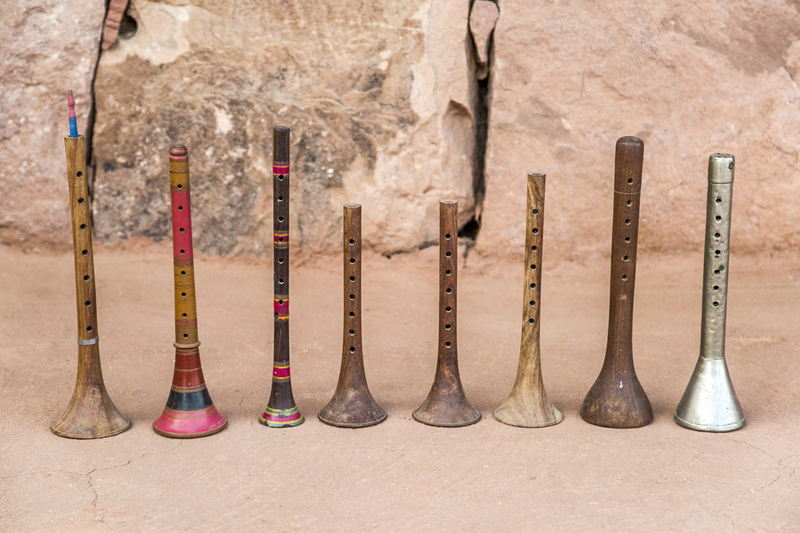 The wind instruments used in the folk music of Rajasthan are designed so that their music carries in the vast, empty distances of the desert landscape. They are played to produce continuous sound achieved through circular breathing. They can be divided between oboes and flutes. 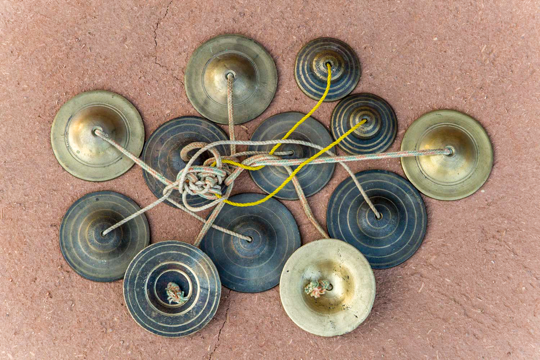 A percussion instrument, manjiras are little cymbals commonly used in devotional music in India, known for their sharp clanging sound. Female dancers of the Kamad community hold them in their hands and tie them to their legs in the Teratali folk dance. They ensure that they strike the manjiras even as they balance metal pots on their heads and sometimes hold swords in their mouths.